Thanks to its shortened one-hour length, the Semifinals of The Voice felt like it moved at light speed Monday night. 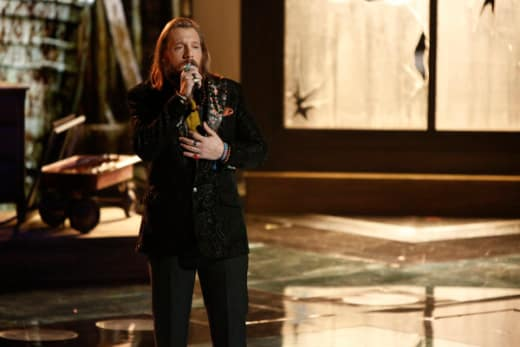 Michael Buble and Blake Shelton both showcased their holiday singing talents, the latter with the help of his entire 16-person roster, but the important matters of the evening were how each one of the remaining contestants did in their last chance at the finals. Trevin Hunte - Team Cee Lo - "Wind Beneath My Wings"
Most likely thanks to his coach, Trevin always seems to be performing the lamest songs, and this week wasn't any different. Sometimes he has taken those poor choices and made them work with great vocals. That wasn't the case this time around. The whole thing felt a bit off, and a few really sharp notes, were enough to give Trevin the early lead in the race to go home. Nicholas David - Team Cee Lo - "You Are So Beautiful"
I think I got whiplash going from Trevin to Nick in back-to-back performances. All of the emotion that Trevin wanted to have in his song, Nick had and then some with that. I don't even care that he has an amazing voice – and is as unique as they come in these competitions – I want Nick to move on simply because of his ability to pour his heart out on stage. That's not to say that others don't feel as much as he does; he's just better at showing it. I think we all need to sit down in a rocking chair after that one. Cassadee Pope - Team Blake - "Stupid Boy"
Everything that Nicholas had in passion tonight, Cassadee had in technical skill. Her tone, her range, and how long she held that one gigantic note had me in awe of her vocals. This performance made me wonder why she has been a pop rock front woman. Her most impressive weeks have been those when she puts on a pretty dress, slows things down, and belts out a country ballad. Don't get me wrong, her upbeat tracks have also been great, but weeks like tonight make her a star. Terry McDermott - Team Blake - "Let It Be"
Oh. My. Goodness. It was the return of Terry's son, the cutest kid in singing competition family history, and he didn't let us down with that one line. Mr. McDermott didn't let his fans down either with that solid performance of the famous Beatles track. Other than an extra-long note or two, Terry didn't really go off book, which means he had no room to really mess up. The guy who I thought was the frontrunner after episode one, Terry looks like he will be there when it all ends. I just don't think he has the best chance of taking home the crown. So there you have people. The final four will be cut down to three Tuesday night. What are you predictions for results night? And who was your favorite performance on Monday?